NASA has failed to find any evidence that Mars’ atmosphere is supporting life after a year roaming the surface of the Red Planet, it was revealed today. 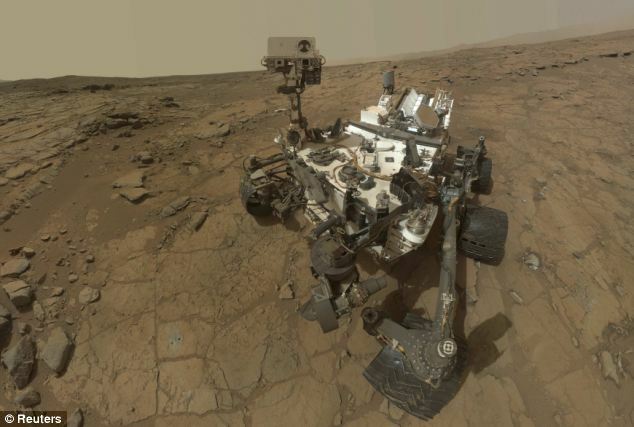 The Curiosity rover currently scanning the Red Planet has not detected any methane, a gas that is produced by living things. Since landing in Gale Crater last year, every morning and evening Curiosity has analyzed Mars’ air and scanned it with a tiny laser in search of the greenhouse gas. Not finding it means that it is unlikely that microbes capable of producing the gas are living below the planet’s surface, scientists said today. NASA had high hopes that the rover would inhale methane after orbiting spacecraft and Earth-based telescopes detected plumes of the gas several years ago. On Earth, most of the gas is a by-product of life, spewed when animals digest or plants decay. “If you had microbial life somewhere on Mars that was really healthy and cranking away, you might see some of the signatures of that in the atmosphere,” said mission scientist Paul Mahaffy of NASA’s Goddard Space Flight Center. During Curiosity’s first eight months on the red planet, it probed the air during the day and at night as the season changed from spring to summer. “Every time we looked, we never saw it,” said Christopher Webster, of NASA’s Jet Propulsion Laboratory, who led the research published online in the journal Science. Christopher Webster said while the result was “disappointing in many ways”, the hunt for the elusive gas continues. While methane is linked to living things, it can also be made by non-biological processes. Mars today is a hostile place – extremely dry and constantly bombarded by radiation. Billions of years ago, the planet boasted a thicker atmosphere and possible lakes. Scientists generally agree that nothing can exist on the Martian surface at present since it’s too toxic. If there are living things on Mars, scientists theorize they’re likely underground. Just because Curiosity didn’t detect methane near its landing site doesn’t mean the gas is not present elsewhere on the planet, said Bill Nye, chief executive of the Planetary Society, a space advocacy group. “Suppose you’re an alien coming to Earth and you landed in the Four Corners area, would you feel as if you’ve explored the Earth?” he said. Several years ago, scientists became excited at the prospect of methane-producing microbes after Michael Mumma of NASA’s Goddard Space Flight Center noticed a mysterious belch of methane from three regions in Mars’ western hemisphere. Michael Mumma, who had no role in the latest study, said he stood by his observations. Earlier this month, Curiosity reached its first rest stop in its long trek toward Mount Sharp, a mountain rising from Gale Crater near the equator. The rover will take monthly readings of the Martian atmosphere during the road trip, expected to last almost a year. Curiosity probe previously found evidence of an ancient environment that could have once been suitable for microscopic life. While the latest finding diminishes hope for present-day life, scientists still hope to uncover signs of ancient life by looking for organic compounds at the base of Mount Sharp.